I have to be honest. I always have a tinge of cringe when I am asked to review a business book. These reservations are based upon experience. I have read some good, bad and, mainly, indifferent. I am particularly nervous when the topic lays claims to trust, integrity and leadership. It is not that I have fixed pre-conceived ideas about how and what these mean or how they should be deployed in business, or even that I have written my own book relating to these topics. It is mainly because I have read more articles/books/blogs within which someone is telling me how it SHOULD be done without much substance, tangibility or real examples of how it HAS BEEN done. And more importantly, how it is increasingly BEING done. Thankfully, for me anyway, Michael’s book is packed with real examples of real people in the real world changing the way that their own business and communities are making real and positive social impact across the whole globe. These are well worth reading about. Mike comes from a family tradition of commerce and trade. He himself decided to take a slightly oblique route with his own business activity through writing and journalism; latterly by working for Initiatives of Change, the global charitable organisation. It is from here that he has garnered the bulk of his real world examples. 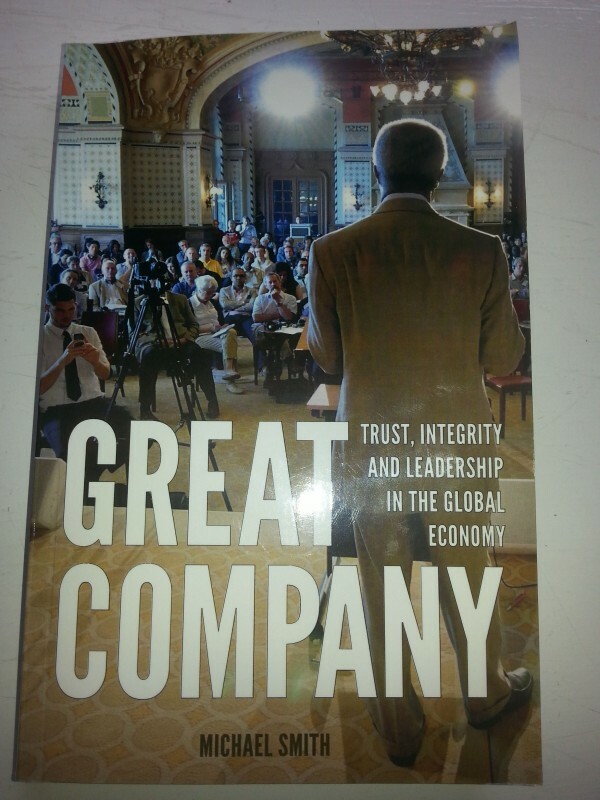 It is from his work with genuinely ground-breaking entrepreneurs, leaders and, very importantly, humble, motivated and passionate individuals from all levels and sectors of society. Old and young, poor and wealthy, these stories are inspiring; these people are inspirational. It is all too easy these days to raise the unremarkable to the status of remarkable; to create celebrity and fame from TV show ratings, to reward image over content, to worship at the alters of superficiality and consumerism. Thankfully, Mike and the people at Initiatives of Change are not satisfied with this. They have genuine passion to bring values into business and into the daily lives of us ‘normal folk’. 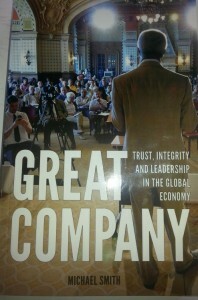 I was personally most keen to delve into the chapter on values; chapter 3, The Five Pillars of Trust. I was, and am still, pleased, engaged and a little pleasantly surprised. It was this particular chapter that switched my attention into over-drive. Why? Because Mike made it real. Too many times have these issues been talked about but not walked about. ‘Great Company’ relates the examples of some great walks! Journey’s by real people who, against all odds, found ways to beat, circumnavigate, ignore the accepted ways and built new and creative solutions. They are thought leaders becoming action leraders. And this refusal to accept the existing options and to build new paradigms is a theme throughout the book. Littered with excerpts from presentations and speeches from renowned and successful thought leaders, the book provides inspiration from the first page to the last. Whether it is his conversations with Kofi Annan or the on-the-ground examples of community development, the theme is consistent – if you really want to, you can. But the book is not just a list of quotes and case studies, as invaluable as these are. Mike brings in his own flavour and views but presents these with a humility and reverence. Anyone who has met Mike will be aware of these natural traits. Whether discussing the banking collapse (chpt 4 and 5), the environment (chpt 6 and 7) capitalism or academia becoming practical (chpt 9), Mike’s humanity shines through the words. In essence, it is people (and their relationships, values and intentions) that create the world and there are some people out there that are making huge strides in creating and developing commercial and social solutions that are shining examples of how social enterprise can and must be ‘enterprising’ and how commercial enterprise can and must be more socially aware and responsible. In fact, with trust and integrity. This is a quite wonderful book. It is written with a gentle humility. It contains real people, real stories and real inspiration. I am afraid that I cannot pass on my copy to you because it is now littered with highlight-marks, notes, comments and little stars in the margins! My way of tracking the most pertinent points. In truth, I could have easily marked-up the entire book. I read it quickly and easily, a certain sign that the content AND style is engaging. I would sincerely recommend that you read Mike’s book. Whether you are working within the social enterprise area or not, whether you have altruistic claims or not, or whether you are simply looking for your next inspirational book, make this one for your list. Thank you Mike. I know that not everyone can attend the Initiatives of Change sessions but you have captured the culture and context of the IoC and managed to make the book personal, accessible and an enjoyable read to-boot.